Today Rob and I went to the CCHS 5K to run/walk. I’m just over 8 months pregnant so we would just run or walk whatever felt comfortable for me. 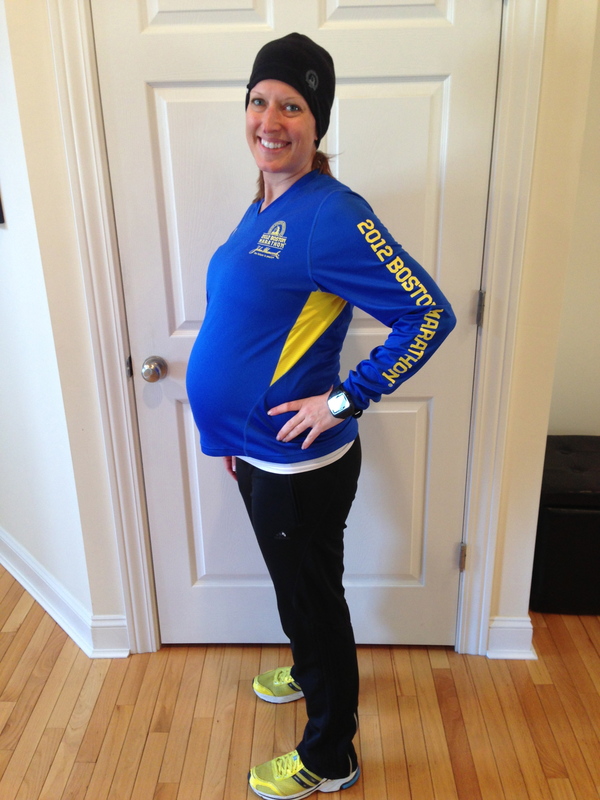 Ready to go, wearing the 2012 Boston Marathon shirt. 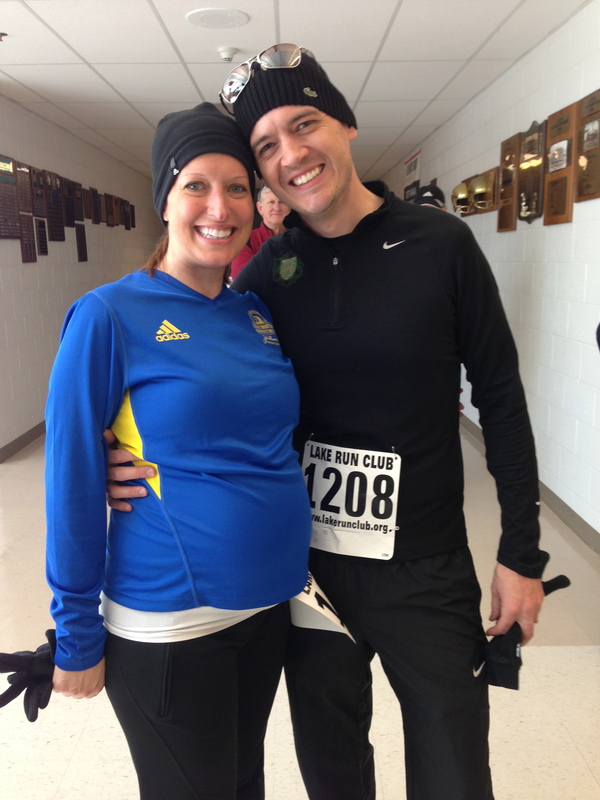 I bought an extra one from another runner that was oversized so I could wear it pregnant. It was upper 40 degrees, sunny and windy. We got to catch up with our friends and hear about their recent races and training schedules. Rob was an awesome husband and checked on my often to make sure I was okay. My heart, lungs, and even hips felt good! The only thing that was sore was my pelvis and I was feeling all the pressure of my belly and the baby. When we got to the last mile I picked it back up. The race finished with about 400 meters on the high school track. I loved that part and picked up my pace to 7:30. For run/walking I ended up at 37:01 (11:56 pace). This will likely be my last version of running in a race until after the baby. If I’m able to do the 5K and 10K at IL Marathon next weekend, I will be walking. It all depends on how I feel that day. It felt so good to be out today and see everyone! Awww you two look cute! Congrats on your race! You being able to do this is such an inspiration. I love how you have run and kept fit through out your entire pregnancy but never pushed yourself into something uncomfortable. It’s truly remarkable! How nice that you guys did this one together! Nice shout out to Boston too with the shirt! Have you found maternity activewear that you like or is this just some of your stuff from before you were pregnant? Thanks! I had to buy bigger sports bras from adidas and Nike. I got a bigger pair of Nike running shorts and then pants from GapFit. I had some old medium shorts and capris from a few years ago that I was able to pull out of my closet and wear to get by.